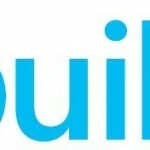 June 2013 CU Breaks Yammer on-premise App? 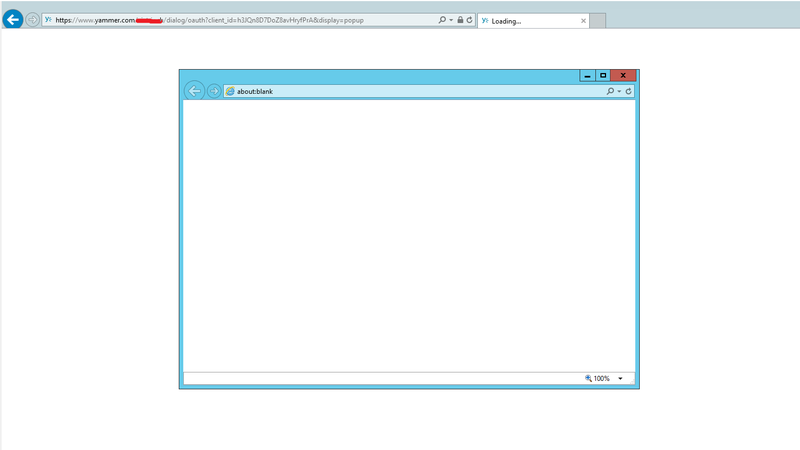 You are here: Home / June 2013 CU Breaks Yammer on-premise App? Second time I talk about the new Yammer App this week, and it’s the second time that it’s bad news unfortunately. 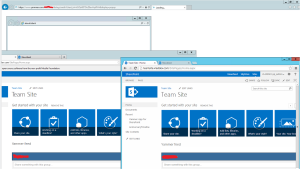 If you are a SharePoint Admin or IT Pro Consultant, you know why not a lot of us like the way Microsoft forces us to install the on-premise Application… Modifying Core SharePoint Files. If you didn’t read the procedure yet, the file that we have to modify is this one: C:\Program Files\Common Files\Microsoft Shared\Web Server Extensions\15\TEMPLATE\LAYOUTS\1033\STYLES\Themable\CoreV15.css. Any Cumulative Update that will need to make changes to that file, will override the changes we do for the Yammer App. By accepting this from Microsoft, it’s like giving all the SharePoint Developers a reason to justify manually modifying the web.config file. “You did it for the Yammer App, you can do it for my solution as well”. Ok, let’s get to the point June 2013 CU and the Yammer on-premise app. As an IT-Pro, first thing I tried after I got the app working was to apply the June 2013 Cumulative Update to see if the first update would break it. Unfortunately, it did. My Yammer app doesn’t work in Internet Explorer anymore. As you saw, there is a question mark in the title, because I did not do enough testing to say if it happens all the time, or it was just me, but it’s something to think about before you apply the patch. Here is what I get. 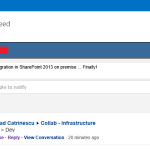 When I open my SharePoint Page, I get the “Log in with Yammer” button.. normal until now. Then, It asks me for the login information.. still normal. And then it stays on this blank screen. A second window opens.. about:blank. And it stays there forever. I did try deleting cookies and everything.. but no luck. However, it works perfectly on Chrome and Firefox. Did you have the same experience? Or is it working for you? 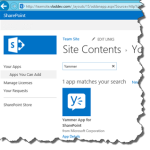 August 13, 2015 1 month left for the Yammer app in SharePoint! 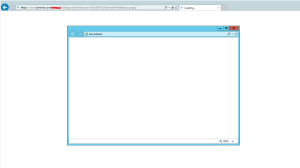 We are not using on-premise… we are using Office 365, and same problem. Identical problem. Some of us are using Firefox or Chrome, and it works fine for those individuals, but the rest who are using IE are experiencing this. 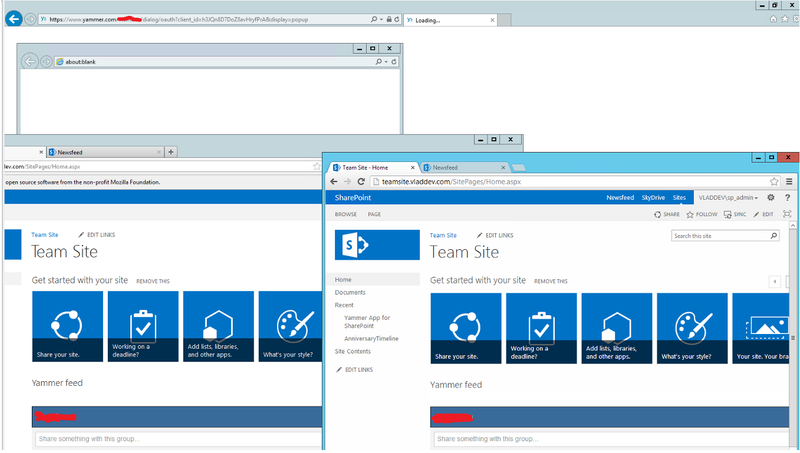 You would think that Yammer (microsoft) would work on sharepoint (microsoft) on Internet Explorer (microsoft). Strange how you have to use a third party browser to do this.